And after 12 episodes, we’ve finally arrived: the Top Chef finale in San Miguel, Mexico. Our three finalists are focused and ready. In her opening narration, Melissa declares that while she started this journey to prove her mettle to her father, that no longer matters. This journey is for her. Mei wants to win the title and cares little for the bounty that accompanies it. Greg wants to prove that his early success was not a fluke - he barely squeaked into the finale and looks to do better. But, of course, there’s one other chef who’ll be joining them - the winner of Last Chance Kitchen. On one side, we have Doug, the reigning champion of Last Chance Kitchen, who offers up a dish of clams with charred pineapple butter. On the other, we have George, who was eliminated for the second time by Greg in the last episode, who serves steamed clams with serrano. Tom declares both dishes terrific but selects Doug as the winner. Doug is overjoyed. He says that he’s been obsessing over his elimination since it happened and knows that he can whip the other three finalists. Big words from a little man. The chefs arrive in Kokiri Forrest - ahem, the church and find Padma standing next to their Guest Judge, Enrique Olvera, a celebrated Mexican chef. For their Quickfire, the chefs will be cooking xoconostle, a prickly pear that’s coveted by Mexican chefs. Greg is muted in his enthusiasm - though he studied up on Mexican cactuses, he didn’t come across this particular variety. Melissa, on the other hand, is fully familiar with xoconostle and grabs some salmon to pair with it. Mei, who wanted the salmon, grabs steak instead. And Mei is up first, with a protein that she’s not entirely happy with. “What was I thinking?” she asks, regarding her selection of steak. She serves a ribeye tataki with xoconostle salsa. Enrique likes the salsa but Padma points out that every piece of steak on her plate has a different level of doneness. Meanwhile, her competitors offer a xoconotle and tomatillo stew (Doug), salmon ceviche with xoconostle and leche de tigre (Melissa), and garlic shrimp with olive oil and xoconostle relish (Greg). Enrique announces the standings for the Quickfire. Greg is surprisingly in last - Enrique found the use of olive oil overpowering. Mei is in third - though Enrique liked her xoconostle salsa, her meat was not prepared correctly. In second is Melissa, who smartly used leche de tigre. And in his second win in two hours, we have Doug, who really highlighted his xoconostle and did a great job with his vegetarian offering. Padma wastes no time in moving forward to the Elimination Challenge. While last time, the chefs were asked to innovate, this time, they’re asked to take inspiration. San Miguel is, apparently, a mecca for artists. The chefs will each randomly be assigned an artist living in the city, and after meeting with them, will have to represent a piece of art that the artist will create while the elimination challenge is taking place. In doing so, each chef will have to feed 150 guests. With such a tall order, some additional help is appropriate. All of the eliminated sous chefs head in - eligible sous chefs, each and every one. Doug, as the winner, gets to choose his sous chefs first and he goes with Adam and Katsuji - the two biggest personalities on the show this season. Melissa goes with George and James, Mei goes with Rebecca and Keriann, and finally Greg picks Katie and Stacy. With that done, the chefs head off to meet their respective artists. Doug is extremely excited about this challenge because (1) his mom was an art teacher, and (2) his artist, like him, hails from Texas. He decides pretty instantly to do a Texas-inspired dish. Greg has a very moody, expressionistic artist who likes to contrast a dark palette with a single bright color. The artist tells Greg that he intends to paint a picture of a peasant. Greg decides to go with something earthy but with a splash of brightness incorporated in it. Mei’s artist is a hoot - a wacky, kooky woman who incorporates a lot of bright colors and wild designs into her art. She encourages Mei to don a huge purple mask and dance around. Mei sees a picture of a girl’s face with a chicken on it and decides to try and make something featuring that ingredient that’s as loud and colorful as the artist that made it. Melissa has a graffiti artist (who apparently owns a gorgeous condo) who’s going to do a picture of a house in sky blue and pink. At the grocery store, Melissa asks for squid ink, intending to use it to color her dish. When told that they don’t have any, she changes her dish to a smoky eggplant ravioli. She imagines the ravioli representing the house, which, when cut into, will reveal darkness. It all sounds very cool. Before we know it, cooking begins in an open-air courtyard. The artists are there, each with a blank canvas and some of their other work hanging behind the cooking stations. Doug is feeling confident about his Texan dish, but worries incessantly about whether his brisket will be done. Greg is focused on making sure that the beef in his dish shines through. Mei wants to ensure that the playfulness of her artist’s personality and work comes through in her dish. Melissa’s smoky eggplant purée looks amazing, and the ravioli appears to be coming out beautifully. The diners arrive, and with them, the judges - Tom, Gail, Padma, and Enrique. Basically, it’s the typical judging panel and their usual guest judge. As a side note, I think it’s interesting how much of a fuss the producers made about a past TC winner, Richard Blais, joining the panel at the beginning of this season. In retrospect, he really only showed up a few times, and on those occasions, has had a very minimal presence. He’s basically been a second Hugh Acheson. Greg’s food is up for tasting first. He gives the judges a grilled strip loin with ancho chile, beets, and a Valencia orange sauce. The chefs rave about how well he’s incorporated the look and color of his painting - with very earthy ingredients set off by a bright (both in color and flavor) orange sauce. Doug, as is his wont, frets about the fact that his dish, when compared to the other finalists, is not “fine dining” enough. He offers up a brisket Texas red chili with tomatillo and a masa cake. Tom finds it earthy but with some great acid. Gail compliments the use of cheese. Finally, we have Mei with her snapper and bass crudo with chicken skin crumble and soy gastrique. It doesn’t look like a lot of food on the plate - basically, bits of bites scattered around one portion of the plate. It’s essentially the type of high-end food that gets ridiculed for having frou-frou flavors and no substance - food that makes you want to go out to Chipotle afterwards because you’re still hungry. Upon tasting the dish, though, Gail says that she found beautiful moments of brightness in it. Tom likes both Mei’s use of acid and chicken skin. Upon regrouping with the other judges, Tom notes that the chefs cooked with heart and passion. Padma says her favorite was Greg and his steak. Gail agrees that his dish was complex and subtle at the same time, and picks out his use of orange as a highlight. Tom says that Greg both represented his artist’s work on the plate and made something delicious. Padma wishes that Mei had been a bit more wild in her presentation, but Tom points out that Mei was wild in terms of her flavor combinations. Gail loved the use of chicken skin and said that there was a lot to discover when she dug around the dish. Enrique liked the warmth in Doug’s dish. Tom says that Doug’s food reminded him of the way chefs can take inspiration from outside of the kitchen - a jarring experience that changes a chef’s style. He notes that Doug hadn’t cooked in this style during any part of the season. Finally, everyone agrees that Melissa did a nice job with her dish, but Tom criticizes her for incorporating certain elements for “shock value and color,” and not for flavor. Gail agrees that there were things on the plate that she wouldn’t personally have paired together. Following this conference, the chefs are brought before the judges, with the four new pieces by the four artists hanging off by the wall. Tom says that all four chefs found inspiration in the challenge and made things very tough for the judges. Someone will go home today, he says, but that chef should hold his or her head up high because he or she made a great dish. Gail notes that Doug took the challenge more literally than any of the other chefs, trying to replicate the look of the piece on the plate. Tom says that sometimes something can come along that reminds a chef of where he came from and who the chef is at his core - this is, Tom says, what today’s challenge did for Doug. He used ingredients he knew from growing up, and thus his dish had a great authenticity about it. Gail liked the elements of art that Mei brought into her food, but wished that she had let go a little bit more in her presentation. Padma agrees, saying that Mei had the skills to push the envelope even more. Enrique, though, compliments her clean and playful flavors. Padma found Melissa’s ravioli delicious, but wonders why she incorporated shrimp into the dish - perhaps, simply to get something pink on the plate, Padma speculates. Tom says that everything Melissa did was done for a reason and technically well-executed, but found the chorizo a bit over-rendered and dried out. Enrique compliments Greg for his representation of his artist’s work and loved the powerful ingredients that were used. Gail notes that there were many elements in the dish that spoke to his artist’s vision, especially the orange sauce that brought visual brightness to the dish and exploded in her mouth. Padma says that Greg and Doug had the judge’s favorite dishes tonight. In announcing the winner, Enrique says it’s the person who took inspiration from his artist and turned it into great flavor. And that chef is... DOUG. Holy cow. I’m stunned. I thought for sure it’d be Greg back on top. Nicely done, Doug. He ransacked his way through Last Chance Kitchen and then swept both the Quickfire and Elimination Challenges. He’ll be the man to beat heading into the final challenge. 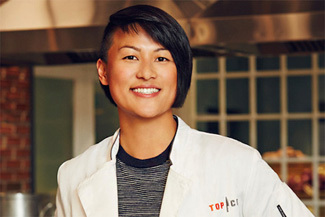 Thus, the final elimination is between Mei and Melissa. Tom says that both made delicious food and that it’s tough to be eliminated in this challenge because both chefs did great jobs. Padma asks if both chefs did everything they could have done. Melissa says that she’s proud of how she represented her artist. Mei declares that she wouldn’t have changed anything - she was happy with all the components in her dish. And the chef going home tonight is... Melissa. It’s a very tough elimination for her, but she should be proud of how she fought her way into the finale. I doubt many people would have picked her to have made it this far. Melissa thanks the judges for her “life changing” experience. She then turns to Mei and says “carry it on, girl.” In her closing monologue, she says that it’s devastating to have come this far and get eliminated. She will leave, however, as a different chef and a different person. She’s learned to cook without any fears.